Losing weight is a side effect of feeling healthy and having increased energy. At Rebel Med Northwest in Ballard, our physicians take a holistic medical assessment to determine where you are with your health. We then support your goals for losing weight, maximizing your body’s ability to handle stress, improving sleep, and encouraging a functional digestive system all to facilitate natural and sustained weight-loss. We make it as easy as possible for you to keep your body moving and feeling well with a customized weight loss plan that fits your schedule and other needs. In a weight loss focused visit, your health markers can be tracked to determine Body Fat Percentage, Lean Muscle Mass, Water Balance, and your Basal Metabolic rate. Tracking these at each visit goes above and beyond tracking a number on a scale, empowering you with the feedback to keep you motivated to stay on track. Come in for your REBEL MED BIA report for only $29.99. Every weight loss program should include a body movement approach. The REBEL MED FITNESS Program utilizes Naturopathic Physician Dr. Andrew Simon’s background in exercise science and kinesiology, to maximize your ability to lose weight and have more energy with a customized work out plan that is right for your body type. You can often find Dr. Simon working out regularly at the Olympic Athletic Club across the street from Rebel Med Northwest. To lose weight naturally, having a consultation with a physician is a powerful tool compared to attempting to do it all on your own. There is a lot of good and bad information out there, and it is important to have a knowledgeable ally to consolidate the information into a simple and workable program. Call now to schedule a free 15 minute consult with a Rebel Med Northwest Naturopathic Physician at 206-297-6013. Dr. Andrew Simon is a Naturopathic Physician and owner of Rebel Med Northwest, formerly Fit Naturopathic. Additionally, he is an adjunct professor at Bastyr Center for Natural Health in the Mind Body Medicine and Physical Medicine departments. He additionally spends time seeing patients at the NW Ballard Senior Center and exploring new technology’s influence on healthcare. If not working Dr. Andrew Simon can often be found working out at the Olympic Athletic Club or enjoying the fine restaurants in Ballard and Fremont. Call to schedule a free 15-minute phone call or online telemedicine visit. Rebel Med Northwest is an integrative medical clinic located in Ballard, Seattle, WA. 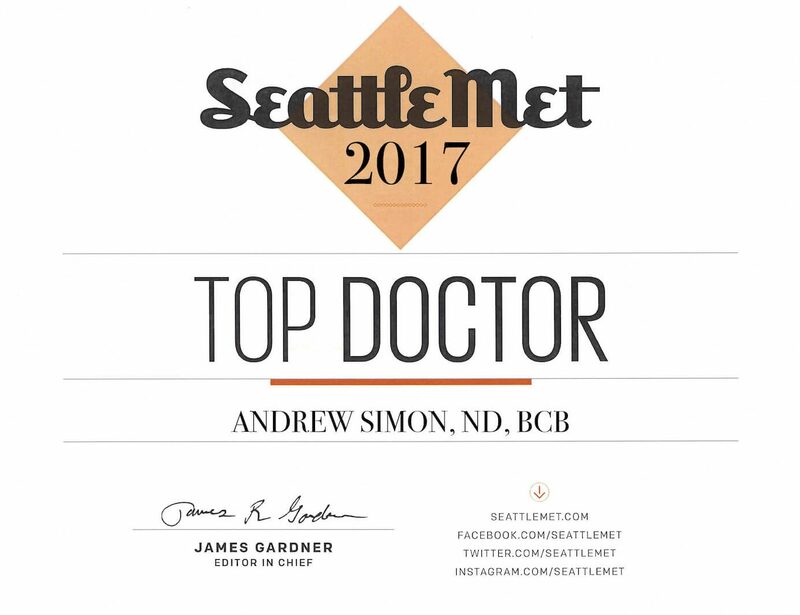 Voted Seattle Met Top Doctor in 2017 & 2018. Rebel Med NW provides Naturopathic Medicine, Acupuncture, Physical Medicine, & Mind Body Medicine services to the Seattle community.